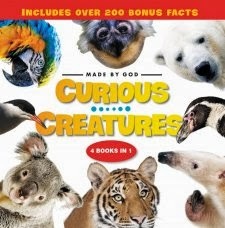 Made by God: Curious Creatures is a 4 Books in 1 volume of Level 2 I Can Read titles, including: Rain Forest Friends, Jungle Beasts, Polar Pals, and Curious Creatures Down Under. Targeted for ages 4-8, this book is is appropriate through all elementary ages and even for older reluctant readers. "Echidnas live all over Australia. They like deserts, forests, and hills. As long as they find their favorite foods -- ants and termites -- they are happy. Echidnas do not have teeth. They catch their dinner with a sticky tongue and crush the bugs before eating. Echidnas are nocturnal so they eat at night" (p. 114-115). First of all, this paragraph is spread over two pages, and each sentence is on a double-spaced line by itself and printed in a slightly larger font. This makes it easy for emerging and reluctant readers to follow, but it is presented in a way that keeps it from seeming "babyish." Also, there is a gradual introduction of more difficult vocabulary, like Echidna and Australia and nocturnal, but mostly one- and two-syllable words so young readers aren't overwhelmed. Then there are the facts presented -- just in this paragraph alone, we learned geography, animal behavior, biology/zoology, and the meaning of the word nocturnal. The best part of all, is that this compilation of books is written from a biblical worldview, and the information is presented from a creationist perspective. Everything is presented as being made by God for a purpose. Curious Creatures is a wonderful cross-curricular resource, and it is supplementing our science studies. But, for any animal lover, it is a fun book for pleasure reading and will entice kids to delve inside and not only learn more about God's marvelous creation, but also to hone their reading skills.